THE SHOWBIZ LION: WHAT DID AMY MACDONALD COOK UP FOR VALENTINES DAY? WHAT DID AMY MACDONALD COOK UP FOR VALENTINES DAY? 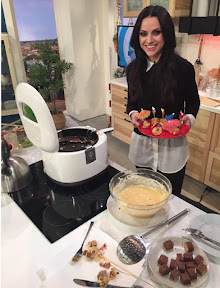 AMY Macdonald managed to cook up the perfect treat for loved ones on Valentines Day - a deep fried Mars Bar! The Scots singer who is about to release her fourth album Under Stars this week, was in Germany appearing on a telly show there when they asked her if she'd make the 'traditional' Scots dish. Although she was more than a tad amused, she obliged by cutting the bar into tiny pieces before putting it in a deep fat frier they supplied. She then garnished it with some cocktail umbrellas. She said: "On German TV this morning they had me deep frying a mars bar for Valentine's Day. I love Germany." After some fans accused the dish as being stereotypical, she added: "Ha! I did tell them that in my 30 years in Scotland I had yet to meet anyone that had ever tried it." Amy, who appeared in Hamburg to perform a gig, travelled to Berlin for her cook off on Fruhstuckfernsehen which means Breakfast TV on Germany's SAT 1 channel.